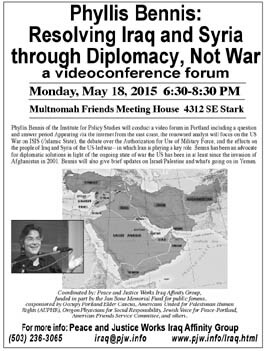 On Monday, May 18, Phyllis Bennis of the Institute for Policy Studies will conduct a video forum in Portland, from 6:30-8:30 PM, including a question and answer period, at the Multnomah Friends Meeting House, 4312 SE Stark. Appearing via the internet from the east coast, the renowned analyst will focus on the US War on ISIS (/Islamic State), the debate over the Authorization for Use of Military Force, and the effects on the people of Iraq and Syria of the US-led war-- in which Iran is playing a key role. Bennis has been an advocate for diplomatic solutions in light of the ongoing state of war the US has been in at least since the invasion of Afghanistan in 2001. Bennis will also give brief updates on Israel/Palestine and what's going on in Yemen. Ms. Bennis' presentation will be followed by a Q&A period for folks attending in person. This event is free and open to the public; donations will be accepted. On-street parking is limited; Meeting House is 4-5 blocks from bus lines #15 (Belmont @ 42nd); #20 (Burnside @44th) or #75 (Cesar Chavez/39th @ Stark). Avoid traveling! Watch the event live on Ustream: http://ustream.tv/channel/occucakes; remove ads using Firefox and AdBlockPlus.